﻿ Who we are - Sail In Ionio, Sailing in Lefkada. Best prices in Lefkada island.Sail In Ionio, Sailing in Lefkada. Best prices in Lefkada island. Nouvart is Sail in Ionio ‘s office star, handles all enquiries, bookings and website. While she values perfect logistics, particularly in the harsh port environment, she will give you all the necessary info and assistance you may need. 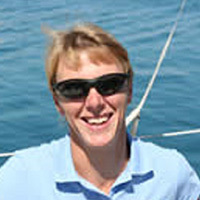 She is working for 20 years now in yachting market as yacht charter and insurance executive manager and she has big experience in handling all the expected and unexpected factors coming of a charter. Her pleasant, companionable and trustworthy character as also her sweet smile makes her very trustable and attractive personality. 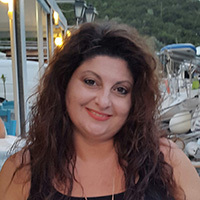 She has Bachelor in Business Psychology and a Master in Shipping Management and has sailing diploma from Glyfada Nautical Club (Athens) and has been co-skipper for many years in yachts transfers all around Greek Seas. 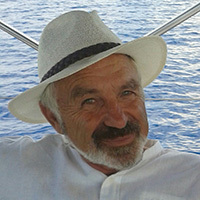 Captain Nikos has been involved with charter yachts for more than 30 years. He is a highly qualified yacht skipper, who knows not only the Ionian Islands, but all the Islands of Greece, having sailed tens of thousands of miles around them. Captain Nikos is very proud to be Greek. He is very knowledgeable and delighted to answer questions about his Hellenic culture and its history. His sense of humor, gentleness and versatility makes him an irresistible, pleasant and friendly company. He maneuvers the yacht like she is his second skin. After service in the Greek army, he went to university and qualified as a pharmacist. However his love for sailing took him down a different career path, eventually operating several charter-yachts of his own and owner of BLUE MARLIN and BEBELA. He is a most adept fisherman and loves to fish from the yacht, often catching tuna and other delicacies for lunch. He is very good surfer and diver with many, many years of experience. He is married and lives in Lefkas the last 17 years. Lesley is your cook/hostess. She loves to cook and prepares the most delicious meals in the Ionian, so as you can imagine, she is always the most popular member of the crew!!! As a qualified chef, Lesley has over 25 years of catering and hospitality experience. She has managed her own restaurant and two hotels in England and has worked in France and Canada at some very prestigious restaurants. She cooks Greek dishes better that Greeks. She loves to cook with fresh organic products and of course our homemade extra virgin olive oil. With her gourmet dishes, she has turned lunchtime into one of the best moments of the day, and with her skills and her nice character, Lesley will help make your holiday an unforgettable one. She is also an experienced RYA Coastal Skipper who has been sailing charter yachts around these beautiful Islands for 10 years. She has a natural ability for making her guests feel welcome and will be the person answering your enquiries and ensuring all your holiday planning is effortless. Lesley will also be there to welcome you aboard. She lives in Lefkas the last 12 years. 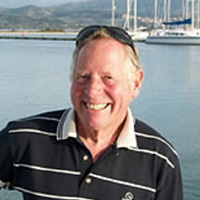 Steve has been sailing his own sea going yachts for over 40 years. When you sail with Steve it is apparent that it has become second nature to him. He has a relaxed style which belies his concern for safety. Steve has logged well over 20,000 miles in command of yachts in the North Sea, the English Channel, the Atlantic, Pacific and of course the Mediterranean. He has 4 sons who are all keen sailors, having been taught from very young on numerous sailing holidays aboard the family yacht. His sense of humor and enthusiasm make him an engaging skipper for your holiday. He lives in Lefkas the last 10 years.